Hi, everyone, and thank you so much to My Fiction Nook for letting me visit today! I’m Antonia Aquilante here to talk with you about The Sorcerer’s Guardian, which is out from Dreamspinner Press today. The Sorcerer’s Guardian is the fourth book in the Chronicles of Tournai series, though it can be read as a stand-alone, as can the other books in the series. 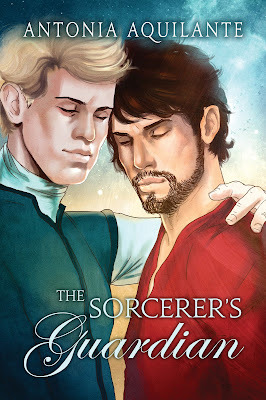 It’s the story of Savarin, a powerful sorcerer, and Loriot, captain of the royal guard, as they clash and get closer and ultimately fall in love while on a mission from the prince to solve the mystery of Tournai’s weakening magical protections. For a large part of The Sorcerer’s Guardian, Loriot and Savarin are on the road alone together as Savarin works on figuring out Tournai’s magical protections and why they’re beginning to weaken. Forced proximity is such a fun trope to play with because it can really increase tension between our heroes and lead to all sorts of interesting situations. In The Sorcerer’s Guardian, Savarin has no desire for Loriot to accompany him on his journey, but the princes insist. Savarin is powerful and believes he can take care of himself—he’s been doing it for years after all. He’s also extremely independent and stubborn. And used to doing just as he pleases, especially when it comes to his work. He’s less than pleased when he can’t avoid Loriot as a travel companion. For his part, Loriot is less than thrilled to be going with Savarin. He feels his place is with the royal family. He takes his duty to protect the princes and the rest of the royal family seriously. He also doesn’t want to leave his own family for so long, but duty compels him to go. Even as he wants to protect the royal family, he also must follow his prince’s orders. He is almost immediately frustrated by Savarin who won’t tell Loriot anything of his plans at first, which leaves Loriot at a loss for how to plan to protect him. They can’t escape each other on their journey. For days on end, they’re alone together as they travel Tournai’s western border. Frustration and annoyance cause clashes between them, and attraction—which they’re both trying to ignore—simmers just under the surface. And then a dangerous storm comes. They arrive at an inn just as it’s beginning, where of course there’s only one room left. The storm will keep them trapped there for days, which pushes them together even more, increasing the tension until it all boils over. I hope you find it as much fun to read as I did to write.